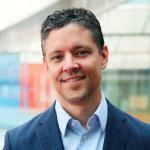 Dave Pagliarini, associate professor of biochemistry and lead investigator of metabolism for the Morgridge Institute for Research at the University of Wisconsin-Madison, is being recognized for major early-career achievement by The Protein Society. Pagliarini will receive one of the society’s eight distinct achievement awards during its 31st Annual Symposium in Montreal in July. The Protein Society is the premier international organization dedicated to supporting protein research. The Protein Science Young Investigator Award recognizes a scientist within the first eight years of an independent career who has made an important contribution to the study of proteins. Pagliarini joined the UW-Madison biochemistry faculty in 2009 and the Morgridge Institute in 2015. The award recognizes Pagliarini for his substantive contributions to the understanding of mitochondrial protein function. Taking an interdisciplinary approach, Pagliarini has revealed that a large number of mitochondrial proteins have no established function, and many are associated with human disease. His goal is to use a range of techniques to connect these "orphan" proteins with mitochondrial pathways and processes. “The award affirms our philosophy that venturing into uncharted territory to study proteins that no one has studied before, while difficult, can lead to exciting and impactful discoveries,” Pagliarini says. As part of the award, Pagliarini and his team will be writing a review article for Protein Science, the journal of The Protein Society, that discusses some of the lab’s work on uncharacterized mitochondrial proteins. Pagliarini notes that some of his top scientific role models have been past recipients of the award, including Ben Cravatt (Scripps Research Institute), Erin O’Shea (president of the Howard Hughes Medical Institute), Jonathan Weissman (University of California-San Francisco), and Carolyn Bertozzi (Stanford University) and Kevan Shokat (UC-San Francisco). “This award builds our confidence and motivates us to strive to emulate the work from these great laboratories," says Pagliarini. This story was written by Brian Mattmiller of the Morgridge Institute for Research and was originally published on their website.